It’s been a mild winter, so we’ve done perhaps 75 rides during the last 150-ish days. 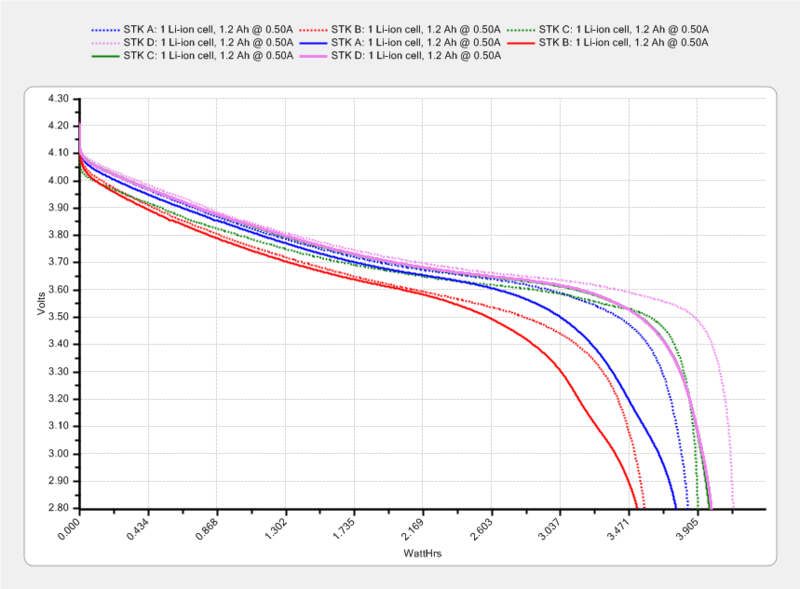 That means each battery has experienced under 20 discharge cycles, which ought not make much difference. The B battery started out weak and hasn’t gotten any better; I routinely change that one halfway into our longer rides. The A battery started marginally weaker than C and D, but has definitely lost its edge: the voltage depression at the knee of the curve might account for the early shutdown. Figuring that the camera dissipates 2.2 W, a battery that fails after 35 minutes has a capacity of 1.3 W·h. That suggests a cutoff voltage around 3.8 V, which makes absolutely no sense whatsoever, because the C and D batteries deliver at least 75 minutes = 2.8 W·h along similar voltage curves.